Martyn Hilbert's Railway Photography - AC Electrics - 86426/E3195 departs from Preston. 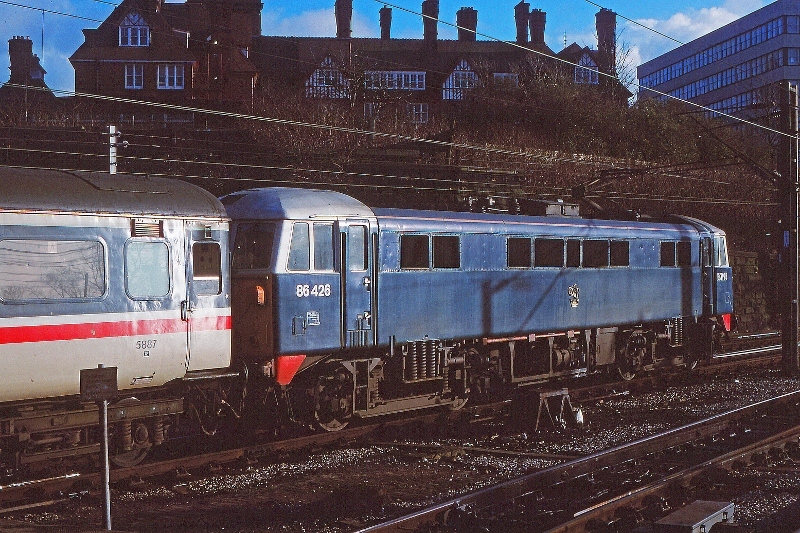 Class 86, 86426 departs from Preston with a service from Glasgow Central to London Euston on the 6th February 1988. To celebrate 21 years of the 'Inter-City' brand, the loco was given a retro 1960s finish in 1987. Complete with its former number, E3195 and cast Lion & Wheel emblem. The locomotive was originally built at Vulcan Foundry in December 1965. It passed into history at Booths Scrapyard in 2005.